Andoras Hamshallow, telemarketer. Rating 3. 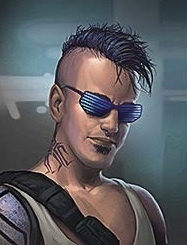 Wanted in numerous Mars City terrorist attacks, murders, and extortions. Lowell E. Wannabe, a low level under city ganger. Rating 5. Wanted by KE. Remington Cold, a consultant. Rating 5. Tall, dark, and handsome. Very bulky legs. Blends well into any social situation. Always talking about women, wine, and guns. Works for Ares in a semi-official capacity, doing weapons/equipment testing for his Cambridge college friend Patrick Henry Hughes. He shares an uppercity apartment with UltraBoy! who functions as both a roommate and bartender/manservant. They have a very strange relationship. Tobias has been stirring up trouble using his fake SIN ‘Andoras Hamshallow’, leading to Hamshallow being wanted for questioning in a number of what LoneStar officials have labelled ‘terrorist attacks’ on Mars City targets. He recently landed a prototype HERF gun from PHH, which he used to good effect whilst assaulting the spaceport. He wants to see if PHH and other Ares contacts want to take advantage of the gang power vacuum in the undercity (and the LS incursions there) to field test new weapons. As such, his new SIN will be a lowly street ganger with a lengthy but not very serious rap sheet. His name? Lowell E. Wannabe. Obviously, he is part Japanese. he also gets his prints removed in a way designed to appear like an industrial accident. Tobias decides to live full-time under the Hamshallow SIN, his alternate identity seeming more appealing than his ‘real’ self. He plans to work for Daedelus and the Exchange, while plotting revenge on Ares and KE.